The school year is coming to an end; soon it will be time for fun in the sun and family vacations. No one is more excited than the kids, who are ready for endless playtime. 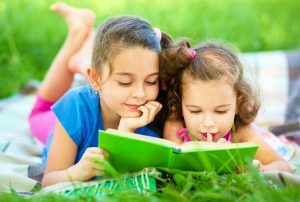 While it’s important to let them be kids and enjoy their time off, it’s also important to incorporate some education into their activities to avoid summer learning loss, also known as the “summer slide”. During their time away from school, children tend to stop exercising their thinking skills which causes them to lose some of what they’ve learned the previous year. Studies have shown, while results vary across subject matter, grade level, and family income, summer loss is equal to about 1 month on average; math and reading show the highest loss with math at 2.6 months and reading at approximately 2 months. Family involvement has been shown to significantly improve a child’s academic success and is key to fighting summer learning loss. Take time to practice these academic skills to help your child prepare for the next school year. Reading- Read books or signs whenever possible – on a road trip, lounging at the pool, or during a picnic at the park. There are opportunities everywhere! Encourage your child to interact whenever possible by asking him to read the signs or to answer questions about what you’ve read. Grammar- Work not only on keeping up with grammatical skills, but improving them. Read stories that are focused on the next developmental level. Begin introducing words and phrases while explaining them using words they already know. For example, “’The princess is beautiful.’ That means she’s very pretty.” or “That watermelon was delicious! Don’t you think the watermelon was very tasty?” Pointing out pictures in books can also help her figure out the meanings of new words. Skills that need improvement– Focus extra attention on areas in which your child may be struggling. If she is struggling with subtraction, work on this concern whenever possible. Instead of having her add her plate of strawberries with yours, after she’s eaten a couple, ask her how many are left. “You had 5 strawberries to start, and you have eaten 2. How many are left?”. “We had 15 miles to go. We have gone 10 miles. How many miles do we have left?”. Try to remember to correct mistakes without reprimanding. E.g. “That’s a big punkin”- “Yes, that’s a very big pumpkin!”. “That’s a good try, but I think there are more than 5 strawberries.” “Yes, that shape has 4 sides like a square, but they are not the same size. What shape do you think that is?” Be patient and stick with it. He’ll soon catch on to his mistakes and work on correcting them. However, if he is reprimanded, he may become self-conscious and avoid answering questions he is not completely comfortable with. Remember, you don’t have to sacrifice family fun for academics! Incorporate these tips into summer fun activities and you’ll have some great family memories WITHOUT the academic memory loss. Categories: Summer Learning. Bookmark this Event.